I have never considered myself to be an artist – or even mildly creative when it comes to drawing. But as a professional facilitator, I HAVE to use visuals to focus and further the discussions. Since my handwriting is more like chicken-scratches (just ask my mother! ), I found Richard Brandt’s book, Flipcharts: How to Draw and How to Use Them, to be incredibly helpful. Even though it is out of print – you can still find copies at https://amzn.to/2ThnLTG. 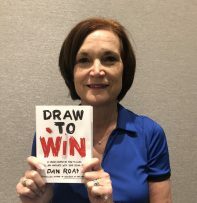 My second favorite book is Dan Roam’s newest book: Draw to Win. Not only does he show you how easy it is to integrate visuals into your presentations and discussions, but the why and when. What works; what doesn’t. Highly practical and useful whether you are using them to communicate your ideas or make sense of others’ ideas. Posted in Book Review on by Kristin Arnold.